I tweeted the other day about LinkedIn’s Resume Builder and I got a number of surprising responses from people I would have assumed would already know that LinkedIn had a resume builder. LinkedIn has been cranking out new features and tools, and I realize that it’s too easy for me to assume that everyone else knows what I know, so I’m compiling all of the interesting offerings LinkedIn has released in 1 place for easy consumption. While you may be familiar with some of them, I can almost guarantee you aren’t familiar with ALL of them. I’ll start with LinkedIn Labs offerings and then cover Outlook, Jobs Insider, Internet Explorer, Firefox and Google toolbars, LinkedIn mobile solutions, the Lotus Notes widget, sharing bookmarklets, emails signatures, the Mac search widget, and LinkedIn Ads. I’ve been waiting for this for a LONG time, and I wasn’t surprised to see LinkedIn create a resume builder that allows people to turn their LinkedIn profiles into Word and PDF resumes. It’s as easy as picking a template, editing and arranging the information, and exporting and printing or sharing via email, LinkedIn, Facebook, or Twitter. 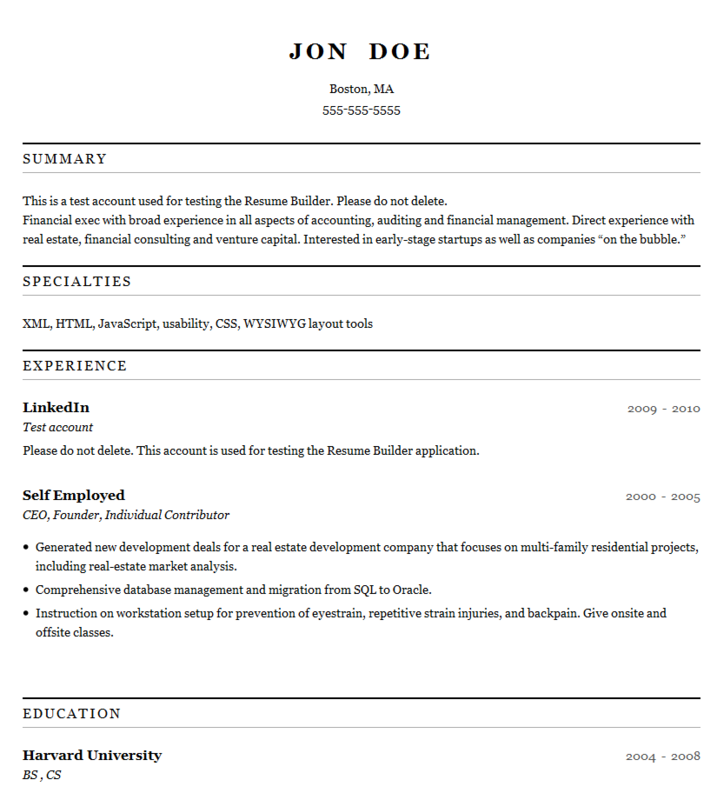 At the time of this post, there were over 19,000 Resume Builder users, but as more people become aware of this feature, I think the number will increase rapidly. You can give it a try by clicking here. As long as you completely fill out your LinkedIn profile as you would a resume, you don’t have to worry about saving your resume on your computer or on flash drives – your resume can live in the LinkedIn cloud. LinkedIn now boasts over 90M members worldwide, and people join LinkedIn at a rate of 1 per second. 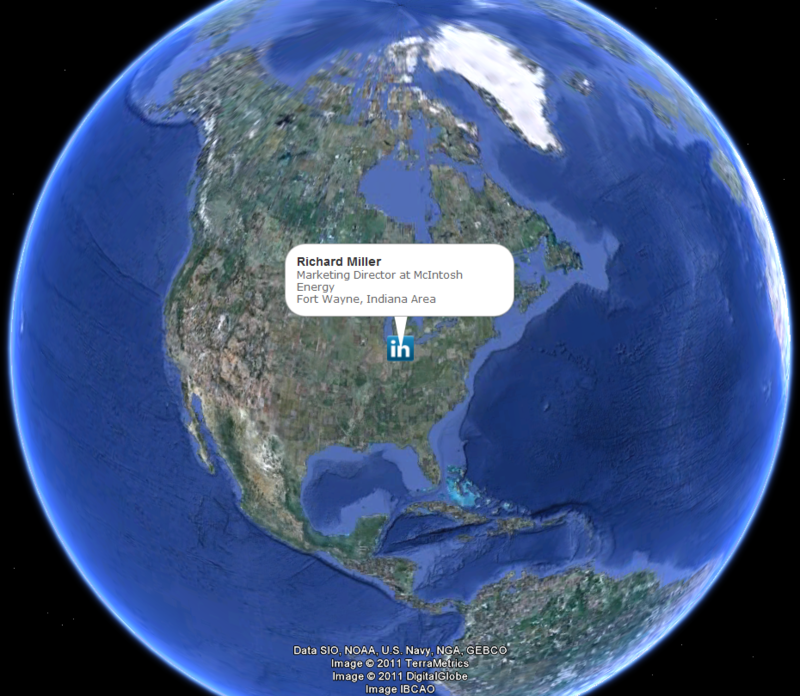 If you want to see what that looks like, all you have to do is have Google Earth installed and click here. I’ve found NewIn to be great when delivering webinars or training sessions – it certainly provides some “wow factor” for anyone who hasn’t seen it, because it’s one thing to say that a new member joins LinkedIn every second, and another entirely to visualize it. 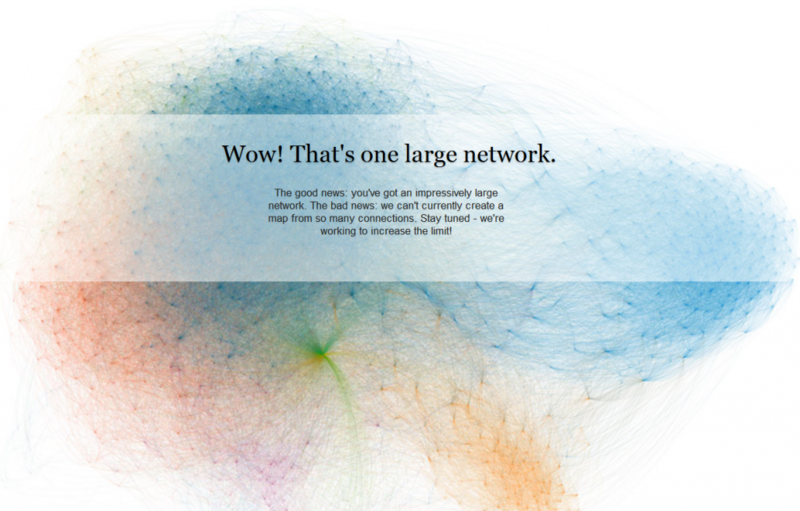 Although LinkedIn’s official description of Swarm is “an eerily beautiful visualization of popular company search queries on LinkedIn,” I’ve seen popular title searches, most recent LinkedIn blog posts, most shared news, and recent jobs posted on LinkedIn. Oh, and the terms are all clickable so you can explore them in LinkedIn. Once you log in by clicking the “Sign in with LinkedIn” button, you can click and drag on the wall to navigate through your contacts, zoom in and out, and search by name, title or status update. At least that’s what I think you can do. When I sign into Infinity, I don’t see my network – but that is likely due to my network size, as I also can’t get InMaps to work either. LinkedIn’s Signal certainly isn’t new, but it is one of the most powerful services they’ve released. Signal allows you to filter and browse only relevant status updates from your LinkedIn and Twitter streams. You can target updates from colleagues, competitors, etc., and narrow or expand your view based on the following filters: Network, Industry, Company, Time published, Location, School or just most popular hash tags. You can also search for keywords, topics or people across the stream of network updates, and tap into an auto updated real-time stream of filtered content. Additionally, you can save your real time searches for quick and easy access. Imagine saving searches to allow you to check in every day and see a real-time stream of updates from every employee in your company. Or, perhaps even better, a competitor! Signal also mines all the shared links on status updates and shows you the most popular links, many of which are the hottest news stories on that topic, updated to the minute, and you can see who’s shared any of those Trending Links. Here’s an example of me checking in on who’s talking about Hadoop. I can instantly which companies are talking about it as well as Trending Links. If you use Google’s Chrome browser (I do), you may be interested in being able to integrate LinkedIn directly into the browser, giving you the ability to share things on LinkedIn and give you easy access to your LinkedIn updates at anytime. 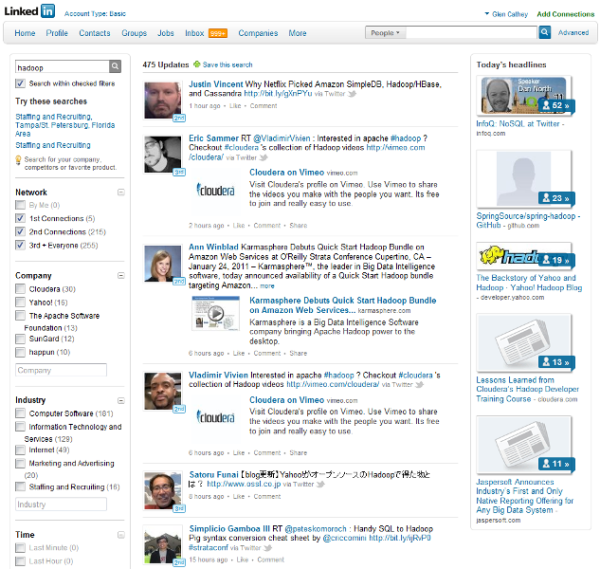 Quite self explanatory – LinkedIn Instant Search allows you to instantly search your LinkedIn network. If your company uses Outlook, depending on how tight and controlled your I.T. 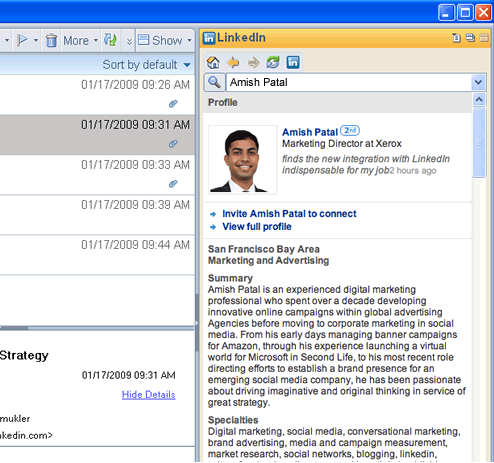 team is, you might have some difficulty downloading and installing LinkedIn’s Outlook toolbar, but I hope not, because it’s a great tool! LinkedIn’s JobsInsider is a fantastic tool for job seekers, and it comes with the LinkedIn browser toolbars (IE and Firefox). Translate web pages instantly with automatic language detection. 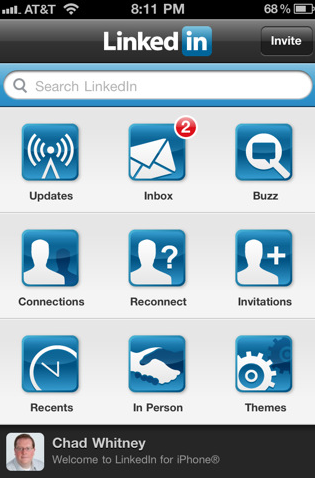 If you don’t already use LinkedIn’s mobile apps, LinkedIn supports the iPhone, BlackBerry, and Palm devices to find and connect with over 90M people, get updates, and share your status – all while on the go. I use my LinkedIn iPhone app daily. If you have a device other than what I listed above, you can go here. Sorry – I couldn’t resist. Actually, when I started in recruiting back in 1997, the company I worked for used Lotus Notes, and although it’s not as prevalent as Microsoft’s solutions, it is nice to see LinkedIn supporting companies that use Lotus Notes. 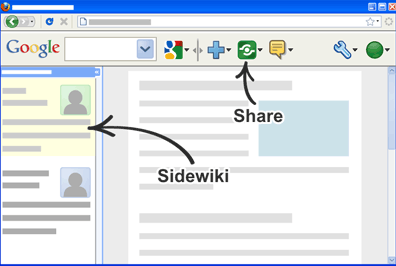 With LinkedIn’s sharing bookmarklet, you can share webpages with your professional network and groups straight from your browser even when you’re not on LinkedIn. All you have to do is find interesting articles/content, click on “share on LinkedIn” from your browser toolbar, add a comment to put your own spin on it, and choose who you want to share it with. 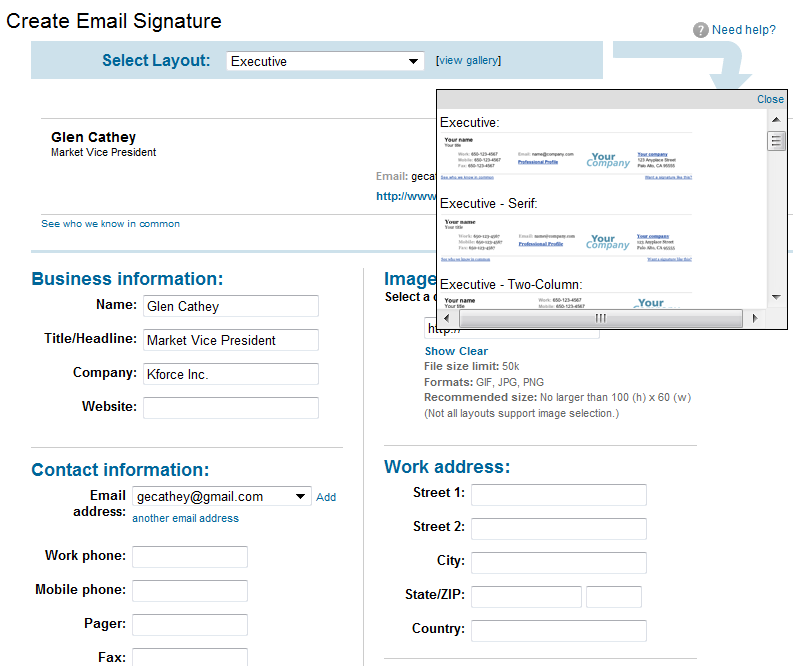 You can create a customized LinkedIn email signature by going here and configuring the layout and the information – it’s very easy and intuitive, and they’re supported by Outlook, Outlook Express, and Thunderbird. Of course, you can also promote your profile with customized buttons that you can include in your email signatures and elsewhere. I regularly get requests asking how to create them. They are a little difficult to find, because the link to them is hidden in a link on your public profile page of your LinkedIn settings. 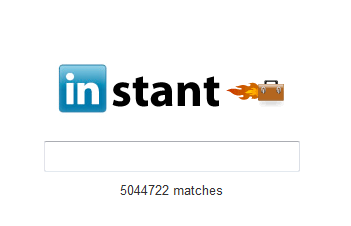 For you Mac-lovers, LinkedIn’s got some love for you too (at least a little). I don’t have a Mac, so I can’t show you what it looks like, but it allows you to search LinkedIn anytime from your Mac Dashboard (OS 10.4 (Tiger) required). LinkedIn Ads are now officially out of beta, and LinkedIn’s coming out swinging with a robust offering. You can control how much you spend each day by selecting a bid and setting a daily budget, which represents the maximum amount you’re willing to spend each day. You can set your budget as low as $10, and you have pay per click (CPC) and pay per 1,000 impressions (CPM). Generally, the higher you bid in the Suggested Bid Range, the more likely you are to receive impressions and clicks. Because you’re competing with other advertisers for impressions and clicks, there isn’t a set cost for LinkedIn Ads. 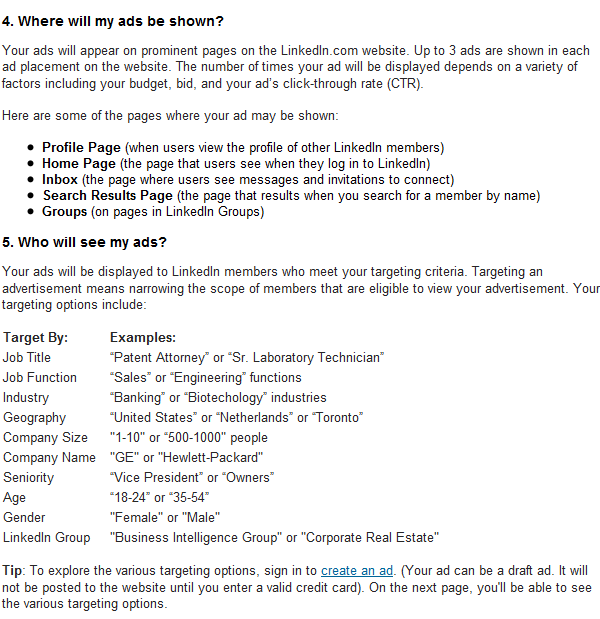 In my opinion, the real power behind LinkedIn Ads is in your ability to precisely target your audience. 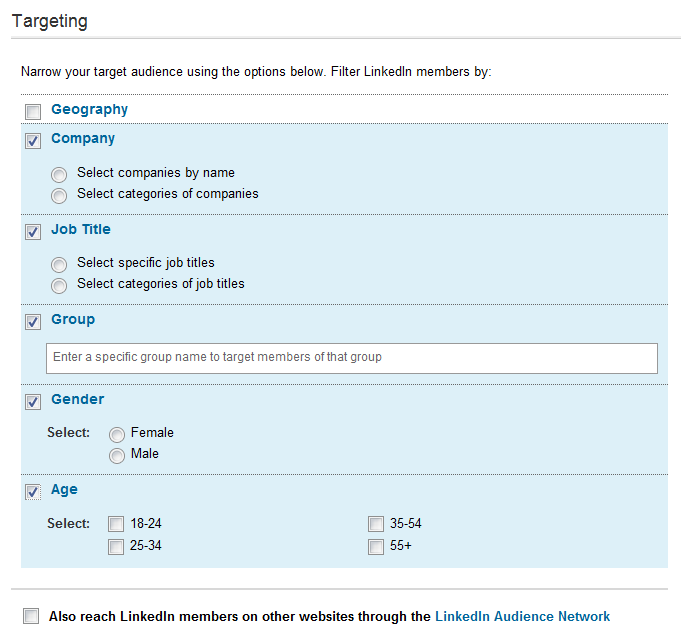 LinkedIn allows you to target your ads by location, company, company size, title, group, gender, age, seniority, job function, and industry. Your ads can be shown on profile pages, home pages, the inbox, search results, and in groups. Did those hyper-configurable and precise targeting options get your attention? Now that I’ve shown you 18 of LinkedIn’s best offerings – go get to leveraging them for results!